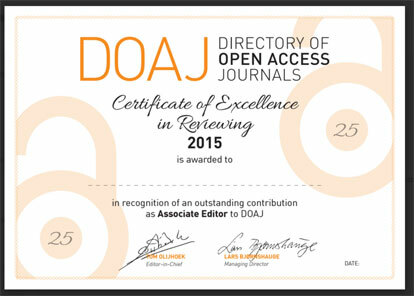 DOAJ has a network of 130 skilled volunteers who spend a few hours a week processing new journal applications for us. Would you like to join us? We are now recruiting volunteers who understand Farsi and/or Turkish. (You do not have to be a native speaker.) You must also be proficient in written and spoken English. As a DOAJ Associate Editor you will be expected to do a few hours of voluntary, unpaid work a week. You will be provided with training materials to help you carry out your duties. The work you do will directly contribute to the quality, reputation and prominence of open access, scholarly publishing across the world. In your role as DOAJ Associate Editor, you will be guided and supervised by an Editor and a Managing Editor. have a working understanding of OA publishing practices. Please note that if you are associated in any way with a journal in DOAJ, you may not be selected due to a conflict of interest. If you wish to apply please complete and submit this form. Thank you for considering volunteering for DOAJ! What are you doing for Open Access Week 2015 (OAW 2015)? Perhaps you are holding a workshop at your university or giving a presentation in your library? OAW 2015 is the EIGHTH OAW and DOAJ stand firmly behind it. To honour this year’s OAW, DOAJ is launching a volunteer loyalty program. You may have read about our wonderful volunteers that give a few hours of their time every week to review new journal applications. Our volunteers do fantastic work and are a talented and dedicated bunch. We decided that we should honour the fantastic work that they do with a series of rewards. Sample image of editor’s certificate awarded for a year’s service to DOAJ. Sample image of associate editor’s certificate awarded for 25 applications completed. We will also be listing all our working volunteers on our site. We’re exploring the option of awarding Mozilla Open Badges so that a DOAJ volunteer can officially declare their work for DOAJ. we will host an annual virtual volunteer meeting to bring our volunteers together and give them the opportunity to network, exchange ideas or ask questions. Watch this space! *Credit to Felipe G. Nievinski, one of our volunteers, for the original idea. Thanks Felipe! Our new network to support our crowdsourcing project has gone live which means that our volunteers of Editors and Associate Editors can now start work! This is an exciting and extremely important step for DOAJ. Although there are no visible changes to the site itself, behind the scenes we have implemented a whole new piece of functionality to support a large number of people all working on the journals and new applications. Certainly, publishers will start to see the benefits as turnaround times from submission of application to decision decrease. Remember: as well as the ~100 new applications we receive every month, almost 99% of all the journals in DOAJ need to reapply to ensure they meet the new criteria! We will start with three pilot teams: Chinese, English and Spanish. To help them find their way around the new system, we will create a series of training videos and some written documentation. Links to those documents will be emailed to each volunteer. As ever, if you have any question or would like to know more, drop me a line.